I’ve written before about what great science teachers do – they ‘just’ make sense, helping all students to see that they can understand and share in the beauty of scientific explanations. I think though, great teachers do another thing; they give students the confidence to struggle with understanding these difficult concepts. With the renewed emphasis on the importance of knowledge in our curriculum, it’s easy to fall into the trap of thinking learning is simply a corollary of the acquisition of knowledge. Get your knowledge organisers sorted, reduce complex ideas to their constituent parts, quiz frequently and all will be fine! Although a body of knowledge is fundamental to learning, it is not sufficient. What’s also important is how this knowledge is organised inside the learner’s mind – as it is the formation of these mental schemata that matter if students are to generate an understanding. This organisation, or construction, takes time, is unique to each student and requires a sufficient amount of mental effort and motivation – it’s easy to give up. So, whilst we can help novices to understand complex ideas by thinking about how knowledge is introduced and sequenced, it is the learner who needs to organise these ideas and construct meaning from them. This meaning making, relating new ideas to what you already know, requires the assimilation of new ideas into existing beliefs, often requiring a significant amount of reorganisation to take place. For example, many students intuitively believe that metal feels colder than plastic because it is at a lower temperature. The scientific explanation is that both materials are at the same temperature, just that metal is a better thermal conductor and so transfers energy quickly away from your hand, making it feel cold. Shifting thinking beyond what you feel is a significant challenge when learning science, and undoubtedly requires some struggle to take place. A great teacher is someone who can structure this struggle, getting the balance right between instruction and construction, giving their students the confidence to persist even when it feels hard. Let’s take an example. I want students to understand the concept of insulation. I introduce the concept by asking students to classify a range of materials as thermal insulators or thermal conductors. I then provide a definition of insulation and ask students to write it down and chant it back. Students can recite what I’ve taught – they can mimic. Now mimicry like this can be an important step on the path to understanding, but it mustn’t be a substitute for learning (Cousin, 2006). Instead, we want students to demonstrate integrated understanding, where disparate ideas are connected, and so we need to provide the opportunity for construction and deconstruction to take place. By structuring a struggle we can encourage students to consider what they they already know and relate this to new information to create understanding. so let’s not put the coat on the snowman. so maybe we wrap him up to keep him cold – my mum wraps ice cream in newspaper. Yes, we must wrap him in a coat to stop the cold from escaping. Bingo! Listening to these conversations is equivalent to mining gold for any science teacher. 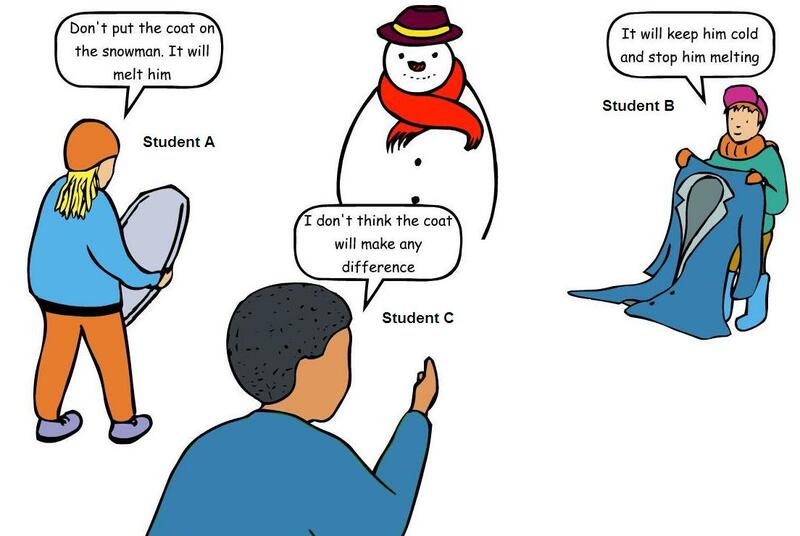 Students have arrived at the right answer but still hold a slight misconception around ‘cold escaping’ that can be corrected. By listening to the conversations we are listening for understanding so that we can provide feedback. If students don’t have the opportunity to struggle like this, they won’t be required to consider and reorganise their knowledge to advance their own understanding of insulation. Of course, we could always tell students about insulating hot and cold objects from the start, but even then, we still need to recognise that students will have understood and learnt the same idea in different ways, and so we must create time and the opportunity for individual struggle and construction to take place. This struggle will also create the opportunity for students to make mistakes, without mistakes feedback from teachers and peers is impossible. How can we structure the struggle? It’s worth thinking then about what good struggle looks like. The struggle should be around how to use and think about the knowledge as opposed to how to acquire it in the first place. For example, teaching from the board is a powerful technique to introduce key knowledge needed to understand a concept, but this is only the starting point. Struggle is not about making things hard per se – it’s about ensuring students have the opportunity to think about specific parts of a concept that are troublesome/important to master. In the example above, the struggle was around the specific idea that insulators prevent the transfer of energy, they don’t just keep objects warm. In this way, the struggle was highly structured and focused thinking around the parts of the construct that matter. And, like any struggle in life, it’s important to reach a resolution if we want to build confidence, and so create time either in the lesson, or subsequent lessons, where you can explore student ideas, correct misconceptions and bring them around to the scientific way of thinking. So, go forth and structure the struggle – lots of ideas here to help. Learning is a messy journey – but some messiness is absolutely necessary.